I have previously waxed lyrical on my love for Scarlett & Jo’s dresses, and you can read my past reviews here. Back in the summer, they did something a bit different, and brought out their highly successful prom dresses in separates. Naturally, I was itching to try them out for myself, so I placed an order with Evans and eagerly awaited their arrival. First of all, I tried the Black Jersey Crepe Top (was £28.00, now in the sale for just £8.00; most sizes available at the time of writing) and the Yellow Floral Print Prom Skirt (was £48.00, now on sale for just £20.00 (wowwww!!) at the time of writing in limited sizes). As always, I opted for these in a size 14 as this is the size that has worked best for me in previous Scarlett & Jo items. For reference, I am wearing my Ewa Michalak S Pieprzyk 32KK/70KK bra in these photos, along with some black high heeled shoes from Primark. I was seriously impressed with these separates! When I ordered them, I wasn’t sure what to expect – except, of course, the usual high quality of Scarlett & Jo items, and I wasn’t disappointed – and I wondered how well the prom dress would work being separated into two parts. This is essentially what has been done here: Scarlett & Jo have cleverly parted their super-popular prom dress and made it into two parts, which can be either worn together or matched with other separates to give a completely different look. So, first of all, the top. I love it! It’s made from a seriously soft and stretchy fabric that is quite thick, so when I tried it on for these photos in the middle of a summertime heatwave I found it too much, but now the temperatures have dropped here in the UK and the weather is cooler, I know I would get a lot of wear out of it. The soft jersey fabric (96% viscose, 4% elastane) is machine washable and does not crease easily or require ironing (huzzah!). As its name suggests the material has a crepe-like feel to it and it stretches to fit curves beautifully. I know some reviews on the Evans website say the top comes up short, but I found it to be a great length. It easily covered my tummy and did not ride up. This is based on the size 14 I tried, so it’s possible that larger sizes increase in width but not in length, and if this is the case then it is a shame and rather unusual for a Scarlett & Jo piece. The three-quarter length sleeves are ideal for autumn and spring outfits but definitely too long for summer wear. The top has gathering at the shoulder seams for a bit of detail, and the scoop neck has ruching at the front centre. I find that the top on the 2 in 1 prom dresses is very low cut, and it’s not adjustable as it is attached to the skirt. As this is a separate, it can be worn tucked in more loosely – as I am in these photos – for a less cleavage-y look, or more tightly tucked in to make it more revealing. Versatility is something I always welcome in my wardrobe! I really like the top and as it’s so versatile it could work with a number of outfits and looks, so you don’t have to keep it solely for wearing with the prom skirts. I’ve actually since bought a few more of these tops so I have spares, and nabbed it in the grey version, too. And now on to the prom skirt. It’s SOOOOO pretty! When I first saw this print online I thought it was very cute but I must admit I didn’t think it was one for me as I am usually attracted to deep, rich colours, rather than pale ones. However, I added this skirt to my order and I’m glad I did as it’s absolutely lovely. The skirt is pretty much identical to the skirts on the S&J prom dresses, so it’s about midi length and hits me mid-calf (I am 5’4). The fabric of the skirt is non-stretch, and it has an underskirt to give it more volume and a special touch. I adore the print of the fabric – it has a fairly pale yellow background and the pink, green, purple, and white print complements it perfectly. It’s one of Scarlett & Jo’s more subtle colourways but I like how it’s so different from what they normally do. The skirt has a thick piece of black elastic at the waist, and this serves almost like a waist belt to cinch the wearer in and highlight the waist. I have found that in the past the prom dress waistband can be prone to fold over. I found that this happened less frequently with the jersey crepe top and prom skirt combination; this could be that because there are two layers of fabric there is more thickness there and so the band is more supported and therefore more sturdy. Good news! 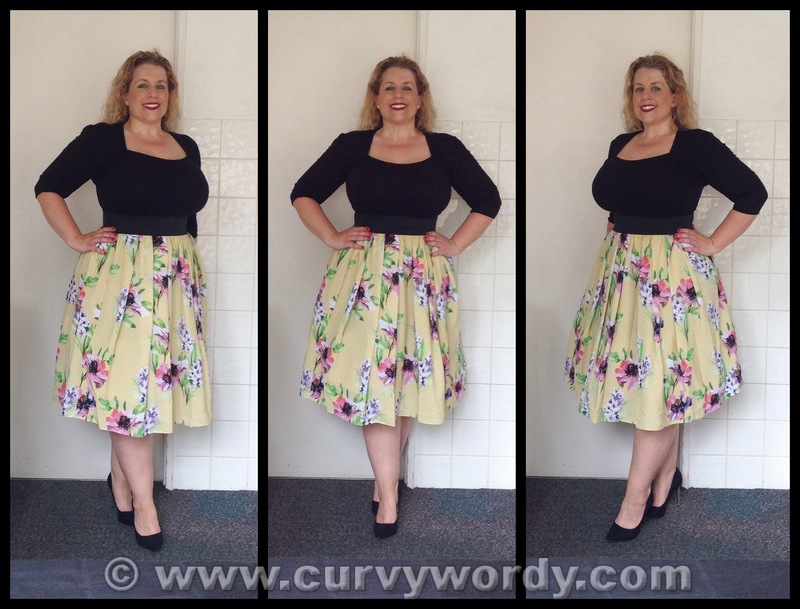 You can read another blog post about this skirt here by the wonderful Debz. I am very impressed with these two separate pieces from Scarlett & Jo. I hope they continue to expand their collections to incorporate different garments and ideas. What would you like to see from them in the future? Let me know in the comments box below. Thanks Anna. Hope you managed to get through the Black Friday issues and place your order! This is nice but I prefer the deeper colours on you. Scarlett & Jo should use you as a model as you always look so perfect in their clothes. I was going to look at this on the Evans website but the other lady said the site is not working. It is so frustrating. I think I prefer deeper colours overall, but it was nice to try something a bit different. I hope you managed to overcome the website problems. I bet you look great. Be confident! I am in love with this model!!! Thank you, but I am not a model. Just a blogger.